On September 19, the “Cantonese Merchants Conference” was held in Guangzhou, with a theme of “Carrying forward the Spirit of Cantonese Merchants, Leading the Innovative Development”. 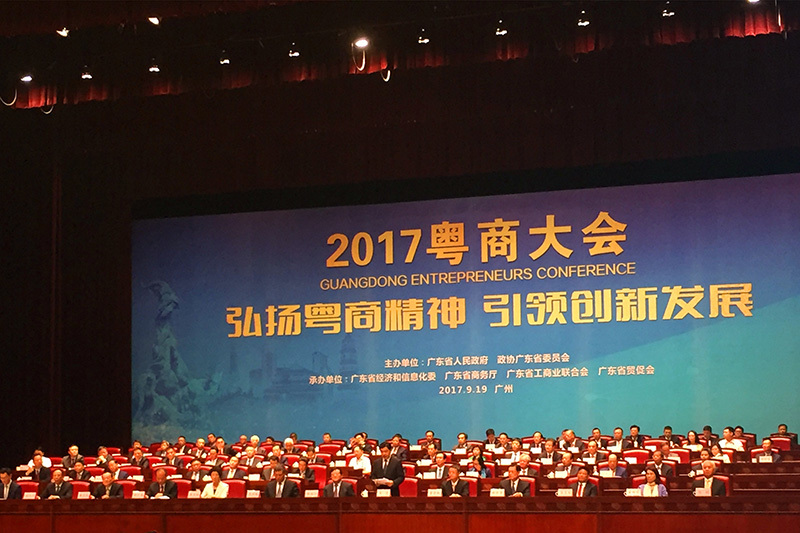 The conference was hosted by the provincial government and CPPCC of Guangdong, organized by Guangdong Municipal Commission of Economy and Information Technology, Department of Commerce, Federation of Industry and Commerce and Trade Promotion Association of Guangdong, and co-organized by 17 organizations such as the Publicity Department and United Front Work Department of Guangdong Province, attended by more than 1,000 Cantonese merchants from home and abroad, including KTC. Meanwhile, the provincial Federation of Industry and Commerce released a list of “Top 100 Private Enterprises of Guangdong in 2017”. For our excellent performance and solid strength, KTC is included in the list. A total of 40 Shenzhen enterprises have made it onto the list of “Top 100”. Statistics showed that the added value of Guangdong’s private economy exceeded 4 trillion yuan in 2016, an increase of 7.8 percent over the same period in the previous year and 0.3 percent higher than the province’s GDP growth. A new significant breakthrough was achieved. Just as Ma Xingrui, the governor of the province, said on the conference, “Guangdong will flourish and get stronger because of Cantonese merchants’ prosperous and strong.” The private economy of Guangdong is an important engine for economic structure adjustment and innovation driving, which has witnessed a stable improvement in quality and effectiveness and a continuous optimization in industrial structure, and played an important role in stabilizing the growth, adjusting the structure, creating jobs and improving people’s livelihood. “Taking the lead in the world”, Cantonese merchants are the pioneers of reform and opening up of China, the trailblazers promoting the innovation driving as well as the doers developing industries to make the nation prosperous. At present, the state is deeply promoting the construction of Guangdong-Hong Kong-Macau Big Bay Area. As a leading force in the development of Guangdong, Cantonese merchants have ushered in a rare historical opportunity on the new starting line. KTC is an enterprise of Guangdong with a history of 22 years. With four characteristics, namely, a pragmatic working style, an innovative spirit, an open mind and a thanksgiving attitude, KTC has been committed to the development of substantial economy, the construction of manufacturing industry. Relying on its strategic foresight and industrial vision, it has correctly grasped the trend of industrial development and the market and secured an advantageous status in the panel display industry. Under the context that Guangdong is revitalizing its substantial economy and in the dynamic social and economic environment, we will insist on innovative development and strengthen our comprehensive strength in the opportunity period, in which the private economy of Guangdong is speeding up transformation and upgrade for a new round of development; we will further enhance our technical innovation, business revenue, scale of assets and contribution to the society, carrying forward the spirit of Cantonese merchants, leading the innovative development and making our due contribution to the economic development of Guangdong.